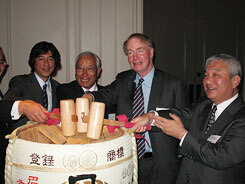 Ambassador Shinichi Nishimiya visited the City of Brotherly Love on October 13th. 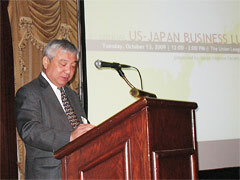 He was invited by the Japan America Society of Greater Philadelphia to give a keynote speech at the organization's 1st Annual Business Luncheon at the Union League,. The event was attended by more than 150 people, including Mayor Michael Nutter, who offered the day's welcoming remarks. Ambassador Nishimiya's 40-minute speech focused on the Japan-U.S. relationship in the wake of the recent change of government that took place in Japan in September. In his prepared remarks, he briefed the audience on Japan's direction under the new government by sharing highlights of the prime minister's first visit to the United States in late September, including Prime Minister Hatoyama's first bilateral meeting with President Obama, several important addresses at the United Nations, and his active participation in talks at the Pittsburgh G20 Summit (for more details on this see Japan Info September). Ambassador Nishimiya stressed his conviction that the Japan-U.S. partnership will remain the cornerstone of Japan's foreign policy and that our mutual, shared values will continue to make the Japan-U.S. partnership the world's most important bilateral relationship. He also thanked the members of the JASGP for strengthening the strong foundation of grassroots diplomacy through their efforts aimed at fostering understanding, personal exchange, and dialogue. Later that same afternoon, Ambassador Nishimiya took part in a tea ceremony at Philadelphia's Shofuso, a seventeenth-century authentic Shoin-style Japanese house and garden in Fairmount Park. Shofuso was gifted by the Japanese people to the Museum of Modern Art in New York in 1954 and relocated to Philadelphia in 1958. In 2007, famed Japanese artist Hiroshi Senju donated a group of murals to it. Finally, Ambassador Nishimiya attended a dinner to honor the long friendship shared between the Japanese Language School of Philadelphia and Friends' Central School. The JLSP was established in 1972 as an educational institution to teach Japanese, mathematics, and other subjects to the children of Japanese and Japanese Americans living in Philadelphia. The JLSP has been located in the Friends' Central School building for over twenty years and the special dinner, arranged to commemorate the two institutions' mutual friendship, was attended by about 100 guests, including staff and teachers from both schools. Ambassador Nishimiya congratulated them on their anniversary and expressed his intention to help the friendship between the two communities continue to grow. On October 17, a welcome back reception hosted by the Council of Local Authorities for International Relations (CLAIR) and the Consulate General of Japan was held for Japan Exchange and Teaching Program (JET) participants at the Nippon Club. The JET participants recently returned from Japan after completing their stints as Assistant Language Teachers (ALT) or Coordinators for International Relations (CIR) in various locations throughout Japan. Ambassador Shinichi Nishimiya expressed his sincere appreciation to the former JETs, thanking them for their accomplishments in the program and wishing them all best of luck and much success in their new lives back in New York. He told them, “I hope each and every one of you will cherish the memories of your days on JET. But Japan needn't become just a memory. My hope is that no matter where life takes you, you will remain an ambassador for the program and an ambassador for the Japan-U.S. relationship. It is, after all, our strong tradition of people-to-people diplomacy that has allowed our friendship to thrive on both sides of the Pacific.” Ms. Megan Miller, President of the JET Alumni Association (JETAA) of New York, introduced the 20 recently returned JETs and encouraged them to actively join JETAA. Finally, Mr. Hiroshi Sasaki, executive director of CLAIR New York, provided warm remarks as well. Launched in 1987, the JET program is aimed at building international understanding at the grassroots level, fostering cross-cultural awareness and developing Japanese students' practical language skills. The JET program has grown significantly; starting with only 848 participants in 1987, today approximately 50,000 young people from around the globe have worked in Japan as part of the program -- more than half Americans. In 2009, nationwide, over 850 people were selected to take part. Even after returning home, JET participants continue to play a significant role building bridges between the U.S. and Japan in their own communities. JETAA of New York is actively fostering a vibrant community of former JETs and helping them remain close to their local Japanese communities. 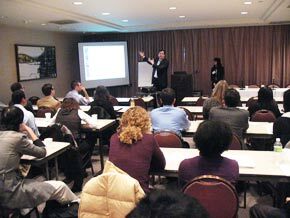 Before the reception, JETAA also organized a career forum for former participants that provided guidance for their post-JET careers through workshops on resume writing, networking and interviewing. Art of the Samurai: Japanese Arms and Armor: 1156-1868 opened at the Metropolitan Museum of Art on October 21st. 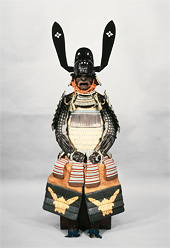 It is the first comprehensive exhibition that focuses on the contrasts between the martial prowess and cultural achievements found among Japan's samurai, who became the dominant social class during the Heian Period (8th to 12th centuries) and controlled Japan for hundreds of years before disappearing at the end of the Edo Period in the 19th century. The samurais' swords and armor developed practical functions as weapons as well as unique aesthetic and decorative qualities. This extraordinary exhibition gathers as many as 215 masterpieces, including 34 Japanese National Treasures and many Important Cultural Properties and Important Art Objects. The focus will be on arms and armor, showcasing the finest examples of armor, swords, archery equipment, firearms, banners, surcoats (jimbaori) and related accessories. Accompanying the exhibition will be film screenings, lectures, family programs, and gallery talks that will give viewers more information about arms and armor from the time period. Art of Samurai continues through January 10th, 2010. Prior to the public opening, the museum held a preview on October 19. 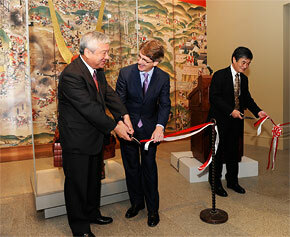 The ribbon cutting ceremony was conducted by Thomas Campbell, director of the Metropolitan Museum, Ambassador Shinichi Nishimiya and Keiji Matsumura, councilor for cultural properties at Japan's Agency for Cultural Affairs, who visited New York especially for the opening of this historical exhibition. Director Thomas Campbell, along with his staff at the Metropolitan Museum of Art, spent a long time in cooperation with colleagues and institutions in Japan, including Japan's Agency for Cultural Affairs, to organize this groundbreaking exhibition. In his welcoming remarks, Director Campbell called this exhibition the result of more than ten years of careful research and planning. He also expressed his appreciation to the organizations and individuals who made the exhibition possible. Mr. Matsumura of Japan's Agency for Cultural Affairs expressed his hope that the exhibition will further develop friendship, mutual understanding and cultural exchange between Japan and the United States. He also pointed out that the Japanese suit of armor that directly inspired Darth Vader's costume in the Star Wars films is on display in the exhibition. Visitors should try to find it! Japanese castles are historical legacies in which Japan's traditional sense of beauty becomes crystal clear. Among these castles, Himeji-jo Castle is the most widely recognized and admired as a monument of great historical value and picturesque brilliance. Those who enjoy the architectural value and aestheticism of the Japanese culture should make a point to visit this castle. Himeji-jo is one of four castles which are designated as national treasures in Japan (the others being Matsumoto-jo, Hikone-jo and Inuyama-jo castles). It was designated a World Heritage Site of UNESCO in 1993. Himeji City, where this famous castle is located, is the second biggest city of Hyogo Prefecture after its capital, Kobe City. If you stay in Osaka, you can travel west by train and reach the castle in a couple of hours. The castle is just a 15~20 minute walk from Himeji Station. The first Himeji-jo castle was constructed in the 14th century. During the last stage of the warring state period, the castle had been occupied by Hideyoshi Toyotomi (1536~1589), who later unified Japan in the 16th century. After Ieyasu Tokugawa (1543~1616) won the battle of Sekigahara in 1600, the castle was given to Terumasa Ikeda (1565~1613) as a reward for his good performance in the battle. By the order of its new owner, Himeji-jo castle underwent large-scale reconstruction from 1601 to 1609 and assumed its current magnificent form consisting of a six-floor watchtower, three smaller three-floor watchtowers and corridors among them. The brilliant white plaster walls, numerous tiered roofs and gables demonstrate a beautiful yet well-built appearance. This castle, like many other war-time castles, contains a lot of maze-like passages, narrow walled ramps and shooting holes in the walls to protect against invaders. The splendid appearance of Himeji-jo castle reminds one of a dancing egret (shirasagi) with its wings spread. The castle is, therefore, widely known by its nickname, Egret Castle (Shirasagi-jo). Although it was constructed to defend against enemies, no fighting ever took place there. The castle has had to overcome many difficulties, including an order by the Tokyo government to abolish castles issued after the Meiji Restoration in 1867 (The castle was once sold and totally abandoned), bombings during World War II (A bomb fell on the tallest watchtower but did not explode.) and repeated reconstruction that helped to maintain its vital and dignified appearance which continues to attract many tourists and visitors; not only locals but people from all over the world. Many films and dramas have been filmed at this castle because of its landscape, which can easily recreate the atmosphere of the old samurai period with perfect authenticity. 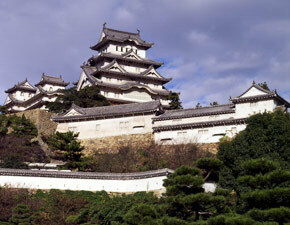 As a matter of fact, many Edo-jo castles (Tokugawa Shogunate) which we see on TV are Himeji-jo castles. Beginning in October 2009, Himeji-jo castle will undergo long-term maintenance and repair work (plastering walls, changing roof tiles, etc), however the castle will remain open to guests. After the spring of 2010, the tallest watchtower will be closed but visitors can continue to tour the other interesting, well-pre-reserved historical sites. 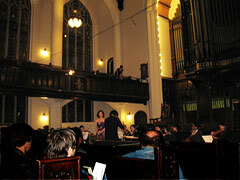 O n the 24th of October, the Reona Ito Chamber Orchestra & Chorus had a concert at the Broadway Presbyterian Church. 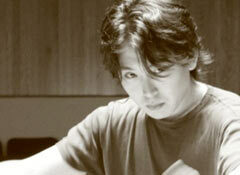 The orchestra was led by a talented young Japanese conductor, Reona Ito. Mr. Ito came to the United States to study international policy at George Washington University and achieved BA. But he decided to become a professional conductor. After composition and conducting study at the Juilliard School, he graduated Mannes College of Music as orchestral conducting major. Mr. Ito is now leading the Reona Ito Chamber Orchestra. He talks about his dream to use his position as a conductor and music as a bridge between different cultures. Although I abandoned the academic life and became a conductor of classical music, Viscount Ishii's speech has remained the most important philosophy of my professional career. His speech stresses how important it is that Japan and the United States, as civilized countries, share the same values of loyalty, liberty, equality and the supremacy of law. Bearing in mind the violation of international law committed during World War I, Viscount Kikujiro Ishii strongly declared that true friendship must rely on sincere discussion and cooperation based on those shared values and that there was no place for suspicion or hypocrisy. I firmly believe that the spirit of his speech is also necessary for a conductor like me who lives abroad (in my case in the United States) and faces the difficult challenge of conducting orchestras by developing mutual trust with various artists from diverse cultural backgrounds. When an orchestra approaches the supremacy of music, the conductor and musicians need to have a great deal of cooperation and communication. The ideas of the conductor must be precisely understood by the musicians, who are then expected to express those ideas using their splendid musical abilities. This relationship is not a dictatorship, although many people may think so. In fact, it is the absolute opposite. If the performers are passive, then their execution will not be vigorous. On the contrary, what happens if the musicians simply indulge themselves without listening to their colleagues playing other parts? What happens if the conductor has too much confidence in himself and treats the performers as his lieges? The result “must be tantamount to anarchy” of sounds. On October 13th, the Japan America Society of Greater Philadelphia gave me the opportunity to attend their 1st Annual Business Luncheon at the city's historic Union League. I had the honor of giving a keynote speech about the Japan-U.S. relationship in the wake of the recent change of government in Japan. Philadelphia Mayor Michael Nutter visited the luncheon and gave welcoming remarks. As I stressed in my speech, Prime Minster Hatoyama's first visit to the United States in September clearly demonstrated that the Japan-U.S. partnership will remain the cornerstone for Japan's foreign policy and continue to be the basis for the further development of our two countries. In November, President Obama will visit Japan, which will be an important step in further strengthening our bilateral relationship. What I strongly recognized during my visit to Philadelphia is that our two countries' strong relationship rests firmly on the close contacts exercised at the grassroots, people-to-people level. During the luncheon, I was asked many questions by the participants and this enthusiasm made me appreciate the strong interest of the people of Philadelphia in Japan and the Japan-U.S. relationship. Later that afternoon, I visited the beautiful Shofuso, an authentic 17th century style Japanese house and garden in Philadelphia's magnificent Fairmount Park. Surrounded by the autumn landscape, I was moved by people's remarkable efforts to keep that special place so clean and beautiful. In the evening I was invited to a dinner commemorating the lasting friendship shared between the Japanese Language School of Philadelphia (JLSP) and Friends' Central School. The JLSP has been located in Friends' Central's building for over twenty years now. Seeing such international cooperation in the field of education, I really envied the students who attend the schools. Overall, my visit to Philadelphia inspired me to renew my determination to spur grassroots efforts like this in every corner of my consular region. Back in New York, the magnificent “Art of the Samurai” exhibition opened at the Metropolitan Museum of Art. I attended the opening of the exhibition. It marks the first time that so many treasured samurai objects have been gathered together. I am certain that this stunning exhibition will become a key event that deepens mutual understanding between people of both countries. I look forward to visiting it as often as possible. SERIZAWA KEISUKE (1895-1984) The Great Market in Naha City, Okinawa, 1940. Hanging scroll, stencil-dyed paper, 61 1/4 x 27 3/4 in. Tohoku Fukushi University Serizawa Keisuke Art and Craft Museum. The Japan Society is currently showcasing the beautiful work of Living National Treasure, Serizawa Keisuke (1895-1984), in an exhibition entitled Serizawa: Master of Japanese Textile Design. 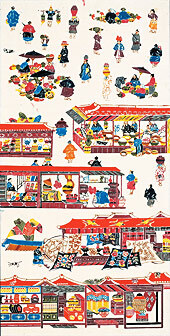 Running through January 17, 2010, the show will display about 100 colorful and playful pieces including large scale screens, scrolls, noren (entrance curtains), kimonos, and book covers. Serizawa's design technique is stencil dyeing. Stencil is placed on a cloth, and a resist paste (rice, wax, or some type of paste) is applied to the open areas. When the paste dries, the fabric is immersed in dye, with the process repeated as many times as necessary to create the desired result. The fabric is then washed to remove the remaining resist paste revealing the design. Using this technique, Serizawa demonstrates how inextricably interwoven the history of textiles is with the history of civilization. Viewers are able to see an overview of not just his achievements, but also his willingness to combine different ideas and styles to create a true Japanese art form. SERIZAWA KEISUKE (1895-1984) Nawa Noren(Straw Rope Curtain), 1955. Noren (entrance curtain), stencil-dyed cotton, 47 1/2 x 34 7/8 in. Tohoku Fukushi University Serizawa Keisuke Art and Craft Museum. While viewing the hanging scroll, "The Great Market in Naha City, Okinawa," 1942, one is able to see ordinary people at the market, buying and selling vegetables, pots, vases, fabrics, wearing kimono-like outfits and carrying items on their head. Liberal application of color makes the market appear vibrant and full of life. Not every creation is overflowing with color. The two-tone work of "Nawa Noren (Straw Rope Curtain)," 1955 makes a bold statement. A rope curtain is depicted on the fabric with the contrasting white rope motif superimposed on a dark background. Serizawa was born into a wealthy kimono dealer family in Shizuoka City. After studying design in Tokyo, he went back to Shizuoka and worked as a commercial designer. His artistic life took off in 1927 when he met Yanagi Muneyoshi who was the leading member of the mingei (Japanese folk art) movement and with his introduction to the Okinawa-style dyeing technique called Ryukyu bingata at an exhibition of bingata in 1928. Bingata dyeing is a craft which combines Chinese stencil dyeing and the hand dyeing skills of yuzen using bright colors and patterns with natural subjects like fish, flowers and water. An example of the bingata influence can be seen in "Bamboo and Peony in the Chinese Character Fuku (Good Fortune)," 1955, in which the Chinese character fuku (good fortune) is depicted using the motif of bamboo stems and peony blossoms in vibrant yellow, red, and blue colors. Serizawa was so moved by bingata that he went to Okinawa in 1936 to master it. SERIZAWA KEISUKE (1895-1984) Bamboo and Peony in the Chinese Character Fuku (Good Fortune), 1955. Noren (entrance curtain), stencil-dyed cotton, 61 1/8 x 31 3/4 in. Tohoku Fukushi University Serizawa Keisuke Art and Craft Museum. Japan Society members and children under 16 free. Every Friday from 6 pm - 9 pm is free. FJapan Arts Matsuri (JAM) is back! Whether your interest lies in traditional Japanese culture, you are curious about the contemporary Japanese performing arts scene, or you just want to have fun, JAM offers the perfect blend to satisfy all. Now in its seventh year, this popular performing arts festival is scheduled to take place on November 21st and 22nd at the Polish & Slavic Center in Greenpoint, Brooklyn. Each year, JAM invites the most energetic and innovative artists to perform at this event. This year's lineup includes Yosakoi Dance Project 10tecomai, Taiko Masala, Faune Dance Troupe, and Samurai Sword Soul. JAM creates an opportunity for emerging artists to perform in front of an appreciative audience. Its Talent Night features about twenty performers, providing a showcase for dancers, singers, and comedians to test their skills before a large, live audience. The traditional segment of JAM this year is the presentation of a Japanese festival float known as dashi. Shaped like a mountain or shrine, a dashii is carried or pushed by people to the accompaniment of festival music. Historically, dashi was the featured attraction at festivals, functioning as a sign of the presence of a god or kami. Over time, their decoration became increasingly more elaborate. Adorned with dolls and lanterns and with its festive musical accompaniment, the presentation of the dashi became the most popular entertainment of any matsuri. 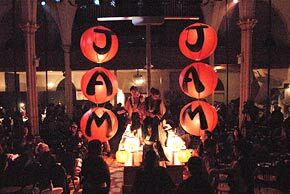 At JAM, the audience can participate in moving the dashi. This year, the exciting and popular dance group, Yosakoi Dance Project 10tekomai, will bring Yosakoi dance to a new level. Yosakoi dance originated in Kochi prefecture and is a highly energetic form of choreographed movements performed to music. While keeping the traditional Japanese essence, contemporary music and dance styles from various other cultures were modified and added to the original Yosakoi dance over the past five decades. Yosakoi dance was originally performed in parade style at festivals; however, it is now also performed on stages in Japan. 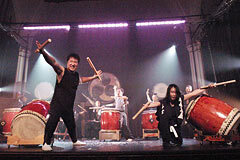 The other JAM participants are Taiko Masala, a drum group based in Brooklyn and Samurai Sword Soul. Taiko Masala founder Hiro Kurashima's goal is to incorporate the influence of different types of music into traditional Japanese music. Samurai Sword Soul will present their Bushi-do spirit, the way of Samurai. Their aim is to introduce people to Samurai virtues though their performance. Combining karate spirit and kendo techniques, Samurai Sword Soul creates a unique style with a heartfelt theme dramatized by exciting and powerful sword fighting. Japanese Musical "Talk Like Singing"